The world today is much different than it was 10 or 20 years ago. While global traveling is much easier, it is also more difficult. Preparing our teams for traveling and serving in strange places (whether in the US or abroad) is essential. For the protection of the team, missionaries and national partners, here are some security guidelines that will benefit the short-term team. Never identify people overseas by name. Sharing personal information of partners overseas while you are overseas can jeopardize the work. Do not share personal information in conversation or through social media. Avoid using Christian and mission terminology. Instead of using terms like “pray, missions, Bible, church, evangelism,” etc., one can say “talk with Dad, the family, the book, the work,” etc. Never identify yourself with a church, denomination or the IMB. Avoid clothing and hats that connect you with any of these groups. Do not leave written or printed information in your room that could identify local church or mission leaders. Places you go like hotels, restaurants, and airplanes have “ears.” Workers in these places may share information they overhear or see with government officials. Consider that all communication is being heard or read by others. Speak by phone as if you are not in a private conversation. Letters, emails, texts, etc. are very public. If names are used, only use first names and never first and last names. Never give the impression of being critical of local governments or religions. As an American, you will likely be viewed with suspicion in many of the places you travel to, so do not say anything negative about governments or religions that will hinder your witness. Avoid visiting with other Christians or missionaries while on your trip. Unless requested by the IMB staff or local partners, contact with other believers in security-sensitive areas should be guarded. Refuse to be photographed or interviewed by news media. Common sense must be used in these cases. You have no control how videos and pictures will be used by others to potentially harm the work of Christ. Always follow the leading of your host missionary and be sensitive to the Holy Spirit. As a new person in a new place that is security-sensitive, listen and follow the directions of your host. Their directions for the team are not meant to hinder ministry, but to enhance long-term ministry. Further, as the Holy Spirit opens opportunities for gospel conversations, but sensitive to your situation and surrounding and tell others about the good news of Jesus. Being security sensitive is not for the purpose of stifling gospel work, but to ensure that it continues long after your short-term team is gone. The goal in short-term missions is coming alongside long-term partners in order to advance the gospel intentionally and/or exponentially that would not occur otherwise. Our world continues to experience devastation and destruction annually. Man-made events as well as natural disasters continue to challenge our minds with “why.” Why has this happened? Why me? Why my community? As Believers, we cannot answer the “why,” but we can respond with love and compassion as we help those affected know that they are not forgotten by God. Southern Baptist Disaster Relief is one of the three largest disaster response entities in the United States. Trained volunteers stand ready to respond when disaster hit across our globe. Disaster Relief ministry provides an opportunity for believers to be the hands and feet of Christ to hurting people. Kentucky Baptist Disaster Relief began ministry in 1984 and is part of the larger Southern Baptist Send Relief network of 42 state conventions, the North American Mission Board, and Baptist Global Response. Kentucky Baptist Disaster Relief is supported by gifts of Kentucky Baptists through the Cooperative Program and the Eliza Broadus Offering for State Missions. This ministry offers opportunities for believers to be on mission for Christ during times of crisis. “Let us not love with words or speech, but with actions and in truth” (1 John 3:18). In times of crisis, people need more than empty words. They need someone to come alongside them with genuine help and real hope. Kentucky Baptist Disaster Relief brings practical help, the healing grace of Christ, and the hope of the Gospel to those devastated by disaster. More than 4500 Kentucky Baptists are trained as disaster relief volunteers. 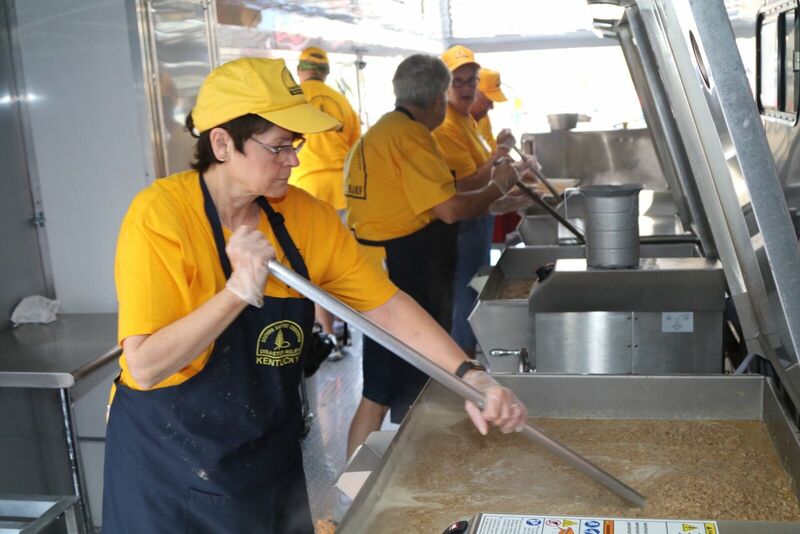 Volunteers can staff mobile kitchens designed to provide thousands of hot meals, move in with a chainsaw after a tornado, assist homeowners in cleaning up a flooded home, offer spiritual care as a chaplain, and provide many other disaster services. To learn how you or your church can get involved in this Kingdom ministry go to http://www.kybaptist.org/dr, or call (502) 489-3527. I love Christmas, the lights, family gatherings, decorations, music and gift giving. It’s a time of year when people show compassion to the hurts and needs of others. We see it displayed in the days leading up to Christmas by children taking gifts to the elderly in the nursing home, groups singing carols and delivering cookies in the hospitals, families adopting children in need of clothing and toys, and residents of the local community gathering to prepare and serve a meal for the homeless. It’s amazing how ministry active we can become at this season of the year as we serve others in the spirit of Christmas. When I see these unselfish acts of Christmas, I’m thankful that this season of peace, joy and love brings out such kindness in most everyone. However, I question our motivation if we only serve and show acts of kindness during the Christmas holidays. Is showing kindness and compassion to others only a seasonal behavior? More than likely, the needs we choose to meet during the Christmas season exist all year long. The elderly in our nursing homes need visits and the gift of your presence all year long. There are sick people in the hospital 365 days a year that would love the prayers, songs, cookies, and visits of others. There are children in our community that need clothing, food and basic necessities during the summer, spring and fall too. If we fail to minister to the homeless in need of shelter and food throughout the year, these members of our community may not be alive next Christmas for us to serve. Christ spent His life showing us what it means to serve others. He took the form of a servant when he was born (Philippians 2:5-7) in the likeness of man. Jesus taught us that we serve Him by serving others (Mark 9:35). He came to serve and proved to be the ultimate servant by giving His life as a ransom for all (Mark 10:45). It seems very appropriate that we celebrate the birthday of the greatest servant, Jesus Christ, by serving others. But let’s not limit our service to only the holiday season. Make serving others a daily behavior that flows out of your love for Christ. When we give Jesus His rightful place as Lord of our lives, we will express that devotion by serving others every day of every week, not just at Christmas.